Looking for a Facebook Marketing Class in El Dorado Hills? 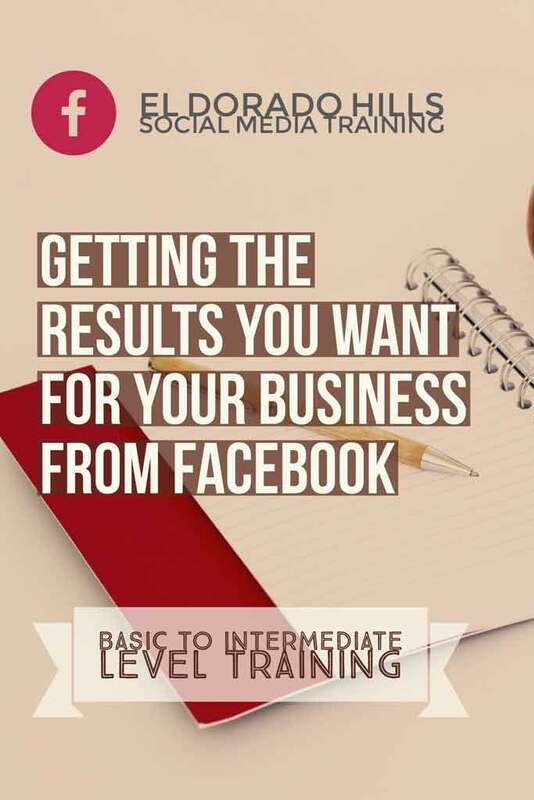 Here is a basic level to intermediate level Facebook Training for small business owners in or near the area. To give you actionable strategies, tactics, and implementation tips that you could use to generate results you want from your Facebook marketing efforts. To keep you, business owners, from spinning endlessly in social media. $225 Only $89 per person. It is a steal! 60% savings that you can use for your Facebook Ads. Phone or Skype review of your ad copy. Phone or Skype review of an ad you already published. Phone or Skype Q&A about how your company is using Facebook. Note: This must be used within 4 weeks after the group session. If you are in the El Dorado Hills and Folsom area, we can also meet in person to do the one-on-one session. Prepaid training – two weeks before the date of training. Facebook profile already set up. Facebook page already set up. Your laptop. (I’m doing the demo using a laptop, so it is highly recommended to bring one to this training instead of an iPad or other mobile devices. Note: If you would like to use your page and profile as a “live” example for the training, please let me know. Seats are limited. Save 60% NOW. Note: We close registration on March 15, or when ALL eight seats are taken. 2. Pay by check. Contact Ruby for the address. P.S. Sorry I don’t trade my time for services. We offer a full refund of your payment if you cancel by 5 PM, Pacific on March 15, 2017. No refund will be given if you cancel AFTER March 15, 2017. If you are unable to attend, you may send a representative from your company as your substitute. 1. Ruby Rusine reserves the right to cancel this training if it does not meet the required number of attendees two weeks before the event. 2. Free half hour training must be used within 30 days after the live training session. Your Trainer is Ruby Rusine, Owner of Social Success Marketing. She has more than eight years experience in social media marketing for companies. They love helping small business owners, and start-ups to grow social media engagement, referral traffic, leads and customer engagement. 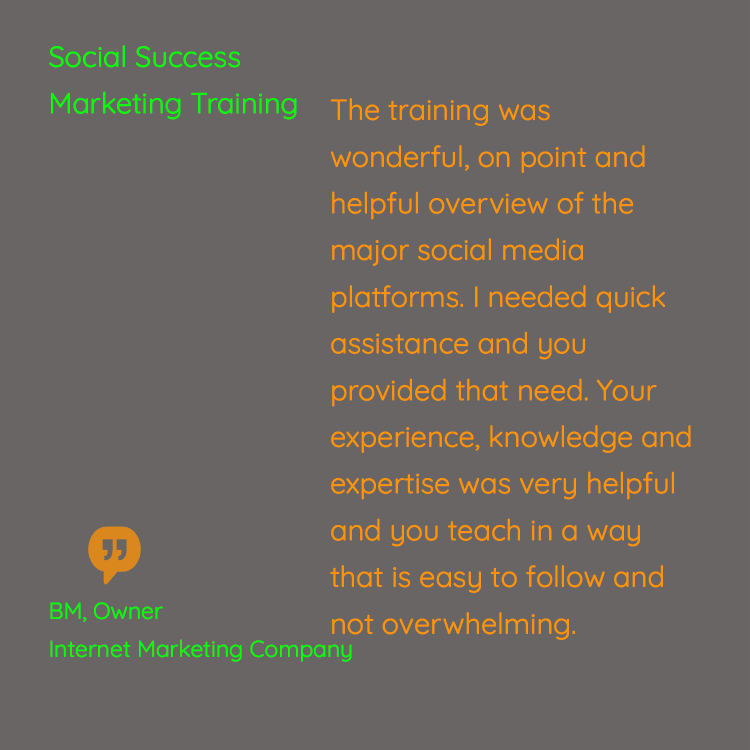 She holds certificates in Advanced Social Media Marketing and Search Engine Marketing with the University of San Francisco, and she has been an avid learner of topics related to social media and search engine optimization.